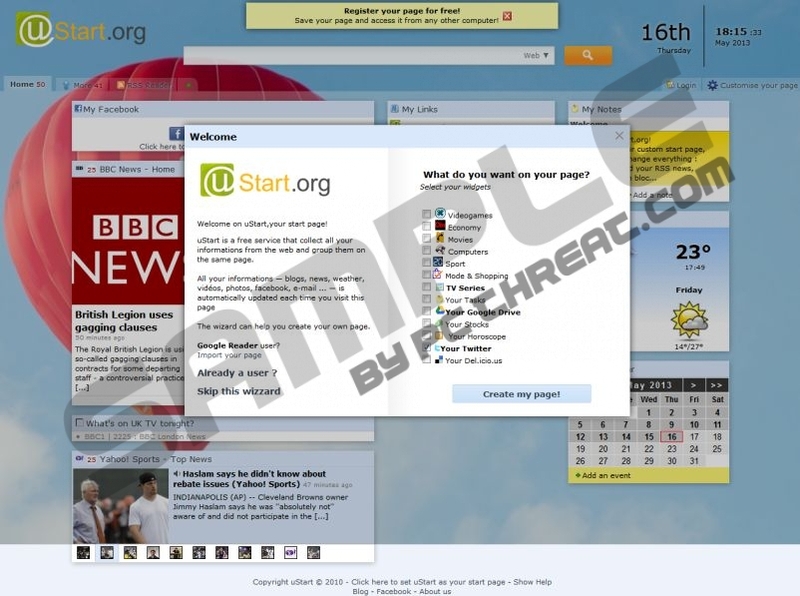 ustart.org is often categorized as browser hijacker, but it does prompt users about the oncoming installation, so this website is more of like adware that displays a number of undesirable pop-up advertisements. The website itself allows you to create a customized home page. At ustart.org you can include your Facebook feed, keep track of your email inbox, get a news feed from popular news websites, keep an eye on your calendar and so on. It does seem that ustart.org is a very useful website that allows you to have all of your favorite social networks in one place. Nevertheless, the website comes with security issues that cannot be overlooked. First and foremost, it is a potentially unwanted application that is very eager to get installed. The moment you land on the website, you will be assaulted by several notifications that ask you to set ustart.org as your default home page. If you do, your default search engine will also be changed to ustart.org. That is not the only way for ustart.org to become your start page. You can also download an application that automatically configures your browser to open ustart.org whenever you launch it. The application can be downloaded at the site itself, or it can come bundled with freeware applications that you downloaded at third party websites. The ustart.org application does prompt you about the oncoming installation, yet a lot of users simply overlook it and end up with ustart.org set as their home pages. It does pose a number of security threats. For example, you web browsing information can be monitored and then later on used for marketing purposes. Or indirectly ustart.org can become responsible for malware distribution and your computer could get infected with dangerous threats! Therefore, if your home page is ustart.org change it immediately and run a full system scan with SpyHunter scanner, to check for any other undesirable applications in your system. Terminate all potentially harmful files at once. Press Reset Firefox in a new tab. Press Reset Firefox again and click Finish. Delete ustart.org, enter a new home page address and click OK.
Set a new default search engine, delete ustart.org and click Done. Should you have any questions about how to get rid of ustart.org, leave us a comment below. Quick & tested solution for ustart.org removal.